Craftsy’s BIG Summer Sale: Save Up to 50% on ALL Online Classes! Want to learn a new skill or brush up on an old one? Now is your chance! You can save up to 50% off on ALL online classes at Craftsy’s BIG Summer Sale! Cooking, cake decorating, sewing, gardening and so much more… all up to 50% off, with some classes starting at just $9.99! This is a sale not to be missed, so make sure you hurry because it ends at 11:59pm MT on Monday, June 9th. 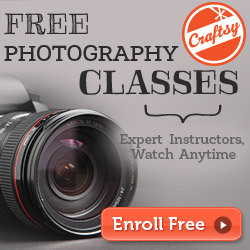 I know I will be taking advantage of this great offer and enroll a few photography classes!